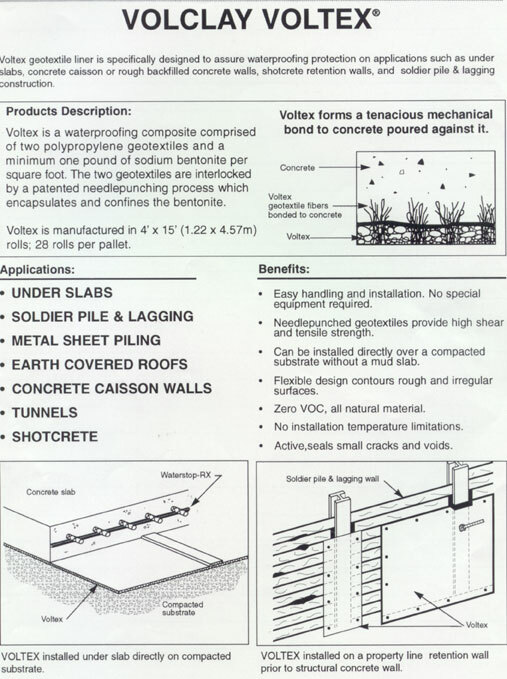 Description: Voltex geotextile liner is specifically designed to assure waterproofing protection on applications such as under slabs, concrete caisson or rough backfilled concrete walls, shotcrete retention walls, and soldier pile & lagging construction..
Voltex is a waterproofing composite comprised of two polypropylene geotextiles and a minimum one pound of sodium bentonite per square foot. The two geotextiles are interlocked by a patented needlepunching process which encapsulates and confines the bentonite. Voltex is manufactured in 4’ x 15’ (1.22 x 4.57m) rolls; 28 rolls per pallet. ·Easy handling and installation. No special equipment required. ·Needlepuched geotextiles provide high shear and tensile strength. ·Can be installed directly over a compacted substrate without a mud slab. ·Flexible design contours rough and irregular surfaces. ·Zero VOC, all natural material. ·Active, seals small cracks and voids. VOLTEX installed under slab directly on compacted substrate. VOLTEX installed on a property line retention wall prior to structural concrete wall.